Imagine for a second that you are one of the Android universe's elite cybercriminals—a "runner"—and you frequently risk your peace, prosperity, and even your life in order to uncover the secrets of the world's largest megacorps. You have your reasons to conduct these runs, but the reasons are your own. Maybe you want to use the corps' secrets against them, maybe you want to sell those secrets, or maybe you're a tech-head who just wants a sneak peek at bleeding-edge designs. Maybe you want to manipulate the stock market just a little bit… making your clients exceedingly wealthy, which makes you wealthy, too. In all cases, timing is everything. 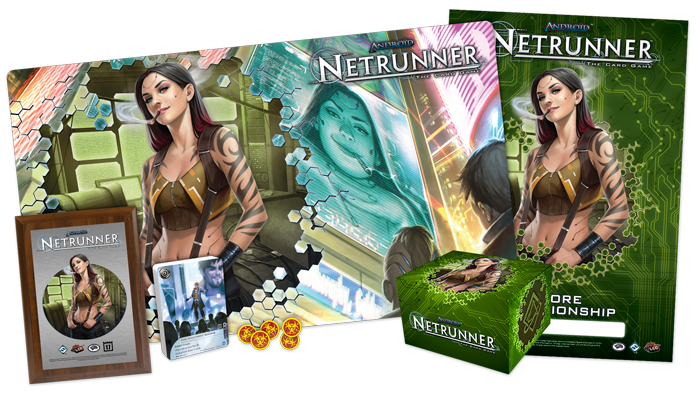 And the time to embark upon your next run is now… The Android: Netrunner Store Championships are underway, having begun on November 25, 2017 and running to March 24, 2018. If you play the game for fun, then the Store Championships are great opportunities for you to boost your return on investment! Store Championships for Android: Netrunner provide you with a great opportunity to test out your newest decks and toy with all the new tricks available to your Corps and Runners. 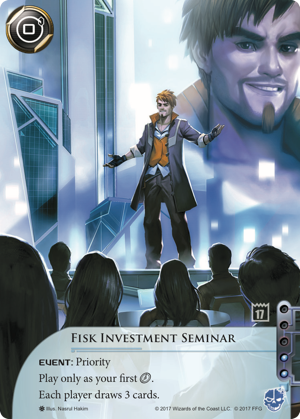 They're also a step up from the Critical Run events supported by the regular Android: Netrunner tournament kits, and as a result, they don't just come with local bragging rights; they also come with a hefty bundle of exclusive prizes. And the best part? You can walk away with a healthy ROI, even if you never make the top tables! Top 32: Alternate art Fisk Investment Seminar. When you take Fisk's advice, the Runner wins. The Corp wins, too. Everybody wins! It's just up to you to make sure you win more. Top 8: Custom deck box. While Laramy Fisk may be happy to use his fame as sleight-of-hand, drawing attention away from his illicit activities, the Shaper known as "Smoke" is all about Stealth. She's shown her face on her daily casts, as well as this deck box, but it's her ability to conduct runs cleanly—without leaving traces of her activity—that allows her to remain a free woman. Top 4: Playmat featuring Smoke. There are two primary dimensions to Android: Netrunner—the meat world and the virtual realm. The place where things are physically present and the place where digital activities occur. In your face and behind the scenes… This dichotomy comes to life in vibrant colors with the Top 4 playmat, which features Smoke behind the scenes and projected larger-than-life while delivering her daily casts. Top 2: Set of acrylic virus tokens. Infest corporate servers in style with these custom, red-and-gold acrylic virus tokens. The biohazard symbol ensures there's no mistaking them for credits, advancement tokens, or power tokens. In fact, they're so clear and loud and "in your face" that they make it all the more amusing to watch the Corp struggle to decide whether or not it's worth spending an entire turn just to purge them. Champion: Art plaque and Regional Championship bye. Commemorate your victory—and your unparalleled dominance of the network—with an art plaque featuring Ele "Smoke" Scovak, and carry your victory forward by turning it into a free first-round bye at your Android: Netrunner Regional Championship. There, you can continue your runs against the corps… possibly even to help them invest more shrewdly! Take your game to the next server… and the next after that. The Store Championships offer thrilling competition, enthusiastic players, and a fantastic return on your investment into fun. Make your plans to attend. 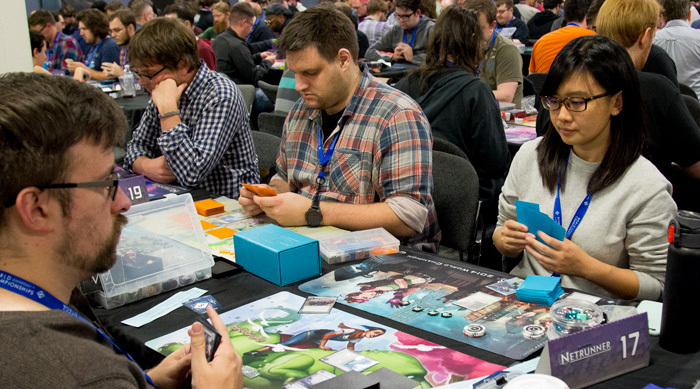 Review our list of Android: Netrunner Store Championships to find an event near you!